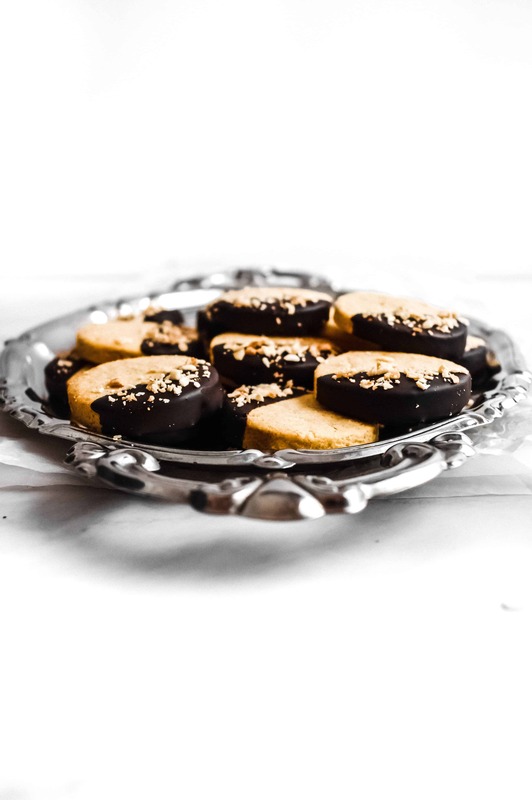 Vegan chocolate shortbread cookies that prove virtually anything can be veganised! 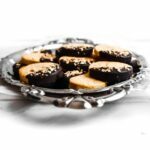 These delicious cookies are simple and quick to make. They are perfect for beginner bakers or families. Moreover, they are deliciously crunchy, making them the perfect on-the-go treat. Who needs butter, anyway? 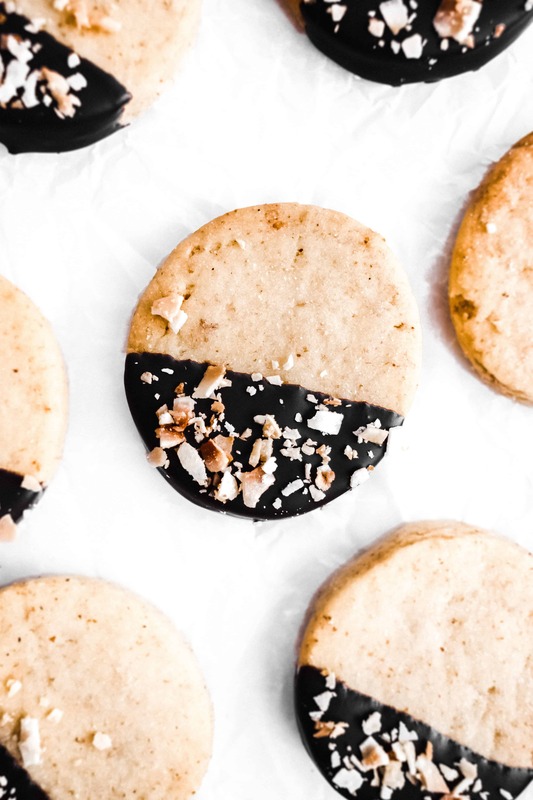 Whether you’re making a small or a big batch of these vegan chocolate shortbread cookies, feel free to experiment with shapes and toppings. My favourite thing about developing recipes is keeping them easy to customise. Thus, you can enjoy these as they are or top them off with all your favourite nuts, seeds, or other toppings like chocolate and coconut shavings. I dipped my shortbread cookies into melted chocolate and topped them off with a sprinkle of chopped nuts. One of the best things about shortbread is its crumby and crispy texture. 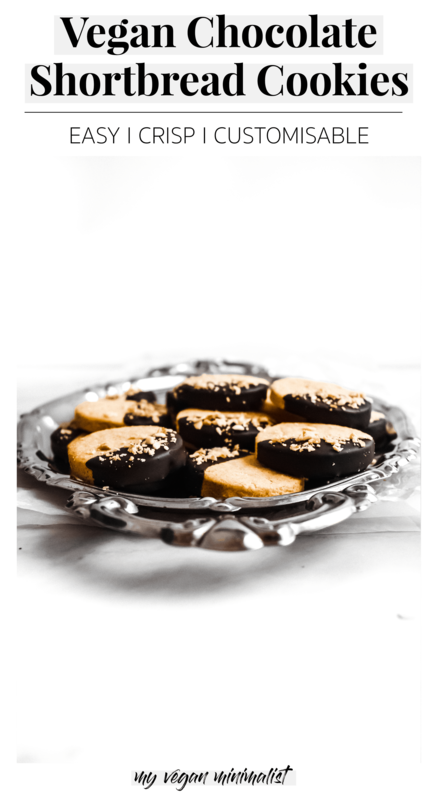 What sets it apart from cookies is the dense, non-chewy inside, which is a signature of every good shortbread. Wondering how to achieve that? When mixing your ingredients, you want to combine it just enough to bind everything into a dough. Be careful NOT to knead or overwork it! If you knead it, you will be left with a tough cookie and not a crumby shortbread. However, if you’re looking for a chewy alternative, why not try out my BestofVegan-featured Chocolate Chip Cookies! When making any vegan shortbread cookies you want to be extra careful when it comes to 2 things: your oven temperature and the baking time. Leaving them in for slightly too short, too long or at the wrong temperature can entirely undermine your efforts. To avoid a crisis in the kitchen, set up your timers and get ready! Did you know that sugar might not be vegan? As a final tip when making these classic vegan cookies, you need to look out for sugar. Not all sugar is created equal and some of it has been filtered with animal bone char. Vegan sugar brands vary from country to country, so you might want to Google your way around any local blogs or forums to find where you can buy vegan sugar. If you’re based in the UK, I recommend Billington’s sugar, which is also the one I used to create this recipe (not sponsored). You can learn all about what types of sugar are vegan over on VeganProducts.org, For a more thorough explanation and a list of vegan sugar brands, you might also want to head over to PETA. Cream dairy-free butter, sugar and vanilla essence. Sieve in flour and cornstarch. Mix with a mixer until crumbly consistency. Chop up chocolate of choice and add to mixture. Cover dough in cling film, set aside in fridge for at least 30 minutes. This will relax the gluten, thus preventing it from becoming chewy and tough. Roll it out until 1 cm thick and cut out your shapes. Place biscuits on parchment paper, sprinkle with caster sugar and bake at 160°C for 40 minutes. P.S. – 40 minutes might initially sound a little bit long for tiny biscuits, but this is needed because of the extra moisture in dairy-free butter. Last but not least, best of luck making these and let me know your thoughts and suggestions in the comments below! If you’re starting out as a vegan or just want to discover simple vegan recipes make sure to follow me on Pinterest, Instagram and Facebook. I’ve also compiled a list of 90 vegan meals you can download for free here.